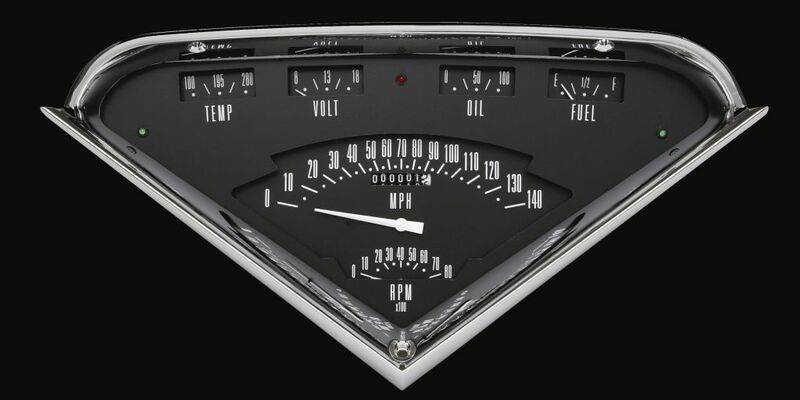 The 1955-59 Chevy Truck Black Tach Force Package, features a dual layer design with 140 MPH Speedometer, 8,000 RPM Tachometer, Fuel (0-30 OHM), Oil, Temp, and Volt gauges with LED turn signals, high beam indicator, and built-in ECM filter signal switch. The package is completely assembled in the bezel and includes, installation hardware, all necessary* sending units, and a wiring harness constructed of automotive grade TXL wire, machine-crimped terminals, tech-flex sleeving, and Molex main connectors. It includes ZST™ and works directly with ECM or VSS signals so no additional control box is needed. *Fuel sending unit not included, fuel gauge is calibrated to stock 0-30 OHM.